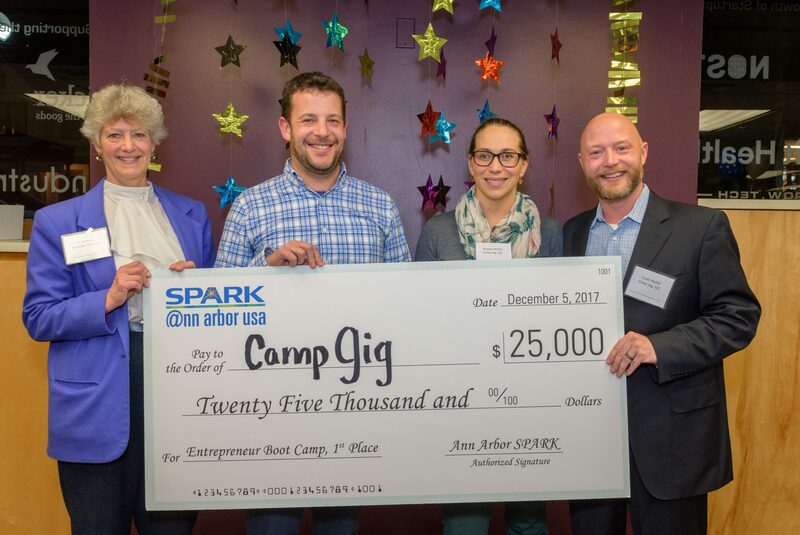 ANN ARBOR — A summer camp staffing system called CampGig.com was the winner of the $25,000 top prize at the economic development organization Ann Arbor Spark’s annual entrepreneur boot camp. Breath of Life, software that promotes meditation, relaxation, stress reduction, and sleep induction, took runner-up and $10,000. In the photo above, left to right, are Lee Gorman, Entrepreneur Boot Camp facilitator, Jonathan Goldstein, Ann Arbor Spark Director of Entrepreneurial Services Operations, and CampGig.com co-founders Brooke and Curtis McFall.A panel of experts made the decisions based on an investor pitch. Boot Camp is designed for entrepreneurs who are prepared to assess and validate the feasibility of their business concept, build a business model, and find beta customers. Participants get hands-on assistance to test ideas over an intense multi-week program, interacting with multiple mentors and early stage investors. The winning company, CampGig.com, brings camps and staff together via an interactive online platform. Its content and site functionality, designed by summer camp owners, reduces the time, effort, and money spent by camps every year when finding staff. Meanwhile, using only a smartphone, Breath of Life’s software measures respiratory rhythms of the user and generates a tapestry of soothing sounds that ebb and flow with the breath in real time. More about Spark at www.AnnArborUSA.org.